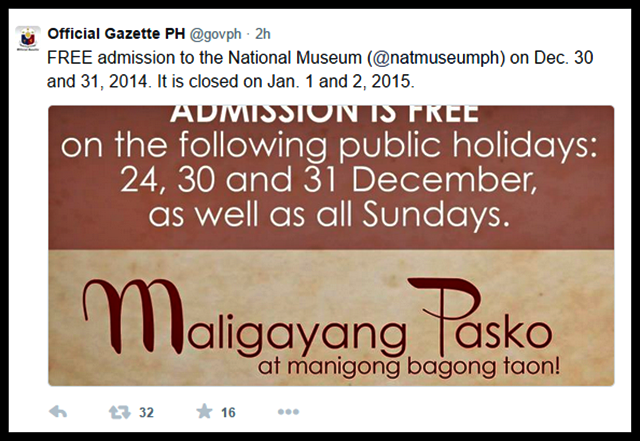 The National Museum (NM) celebrates Rizal Day by offering free admission. Come to the NM tomorrow, December 30, and view artworks for free by our national hero, Jose Rizal. One of the more important pieces in the National Fine Arts Collection is this terracotta sculpture "Mother's Revenge" by Rizal. It features a mother dog attacking a crocodile that harmed her pup. It is a National Cultural Treasure. The management and staff is looking forward to your visit but remember besides December 25 & 26 and January 1 & 2, NM will also be closed on the two Mondays: December 29 and January 5 for its usual cleaning and maintenance days. Remember that admission is free on the public holidays which fall on Tuesday and Wednesday, December 30 and 31. The National Art Gallery is part of the National Museum complex in Manila and is in the Old Legislative Building (along Padre Burgos Avenue). The complex also includes the Museum of the Filipino People (Old Finance Building), National Planetarium and the National Museum of Natural History (Old Tourism Building) which will open late 2015.